Be the first to share your favorite memory, photo or story of Marleen Ann. This memorial page is dedicated for family, friends and future generations to celebrate the life of their loved one. 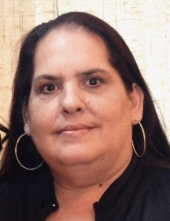 Marleen Ann (Picheco) Jackson, age 54 of Waterbury, passed away Friday, April 12, 2019 in Waterbury. She was born April 25, 1964 in Bridgeport, daughter of James and Helen (Lubas) Picheco and had been a lifetime area resident. Marleen who had a heart of gold had worked at Dunkin Donuts in Seymour for over 20 years. She was an avid Yankee Fan, loved her family, especially her grandchildren and enjoyed attending their various functions and games. Survivors in addition to her parents include her partner, Charles Spencer, four children, Tiffany Jackson, Joseph Jackson, Jeremy Jackson and his partner Alicia and Jeffrey Jackson; three grandchildren, Adrianna, Jayden and Aliyah Jackson; two brothers, James and Michael Picheco; one nephew, James Picheco one niece, Jasmine Mcghee; and the father of her children, Joseph Jackson. Friends are invited to attend her funeral service celebrated by Deacon John Piatak on Tuesday, April 23, 2019 at 7:00 p.m. in the William R. McDonald Funeral Home, 2591 Main St., Stratford. Friends may visit with her family Tuesday from 5:00 p.m. to 7:00 p.m. before service time. To send flowers or a remembrance gift to the family of Marleen Ann (Picheco) Jackson, please visit our Tribute Store. "Email Address" would like to share the life celebration of Marleen Ann (Picheco) Jackson. Click on the "link" to go to share a favorite memory or leave a condolence message for the family.